Place rice into a bowl with enough water to cover. Set aside to soak for 20 minutes. Heat the oil in a large pot or saucepan over medium heat. Add the cinnamon stick, cardamom pods, cloves, and cumin seed. Cook and stir for about a minute, then add the onion to the pot. Saute the onion until a rich golden brown, about 10 minutes. Drain the water from the rice, and stir into the pot. Cook and stir the rice for a few minutes, until lightly toasted. Add salt and water to the pot, and bring to a boil. Cover, and reduce heat to low. Simmer for about 15 minutes, or until all of the water has been absorbed. Let stand for 5 minutes, then fluff with a fork before serving. 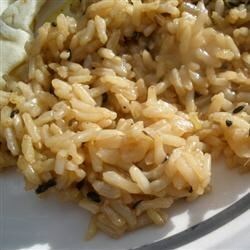 This savory Indian rice is flavored with whole spices and sautéed onions. Delicious! I used brown basmati so I had to cook it longer but it went sooooo well with the Dahl recipe and the Naan bread recipe. Yummy!